You can make this absolutely delicious, Easy Homemade Cream of Mushroom Soup in just 20 minutes! 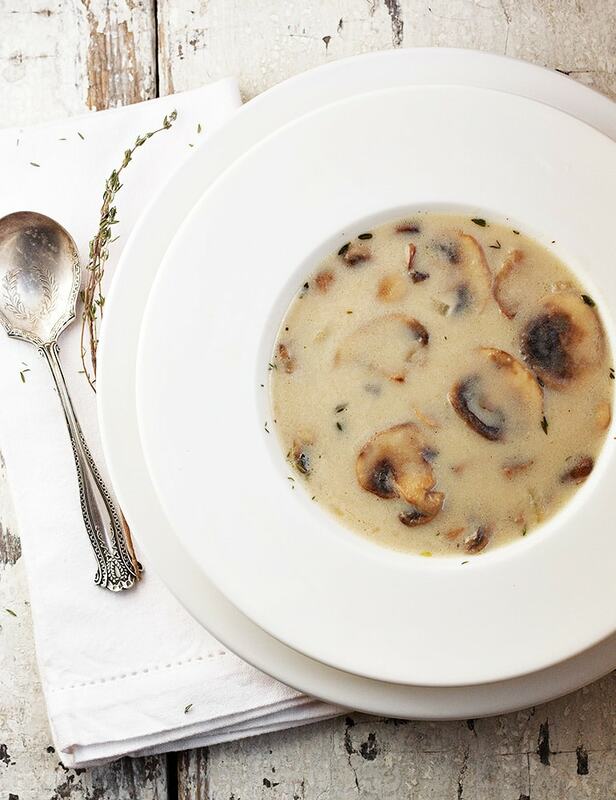 Perfect for a comforting homemade mushroom soup any time. I have been sharing some classic recipes in the past few weeks that, while not glamorous, are just solid recipes for every-day dishes. This classic cream of mushroom soup recipe is one of those. Beyond being incredibly delicious, this soup is ready to eat in just about 20 minutes. Just let that sink in for a few seconds … delicious … soup … 20 minutes. You’ll never open a can of mushroom soup again! This mushroom soup is not super thick, at least not like the gelatinous canned version. It’s pleasantly thick. If you like, you can puree a bit and add it back in to the soup to thicken it more, as well. The thyme is the perfect spice for mushroom soup. It’s subtle, but present and complements the mushrooms without overpowering them. I often just use plain, old pre-sliced button or mini bella mushrooms, but a combination is nice, as well. Whatever you like or you have around is fine. 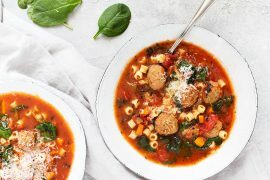 The real beauty of this soup is that you can walk in to the kitchen, throw together just a few ingredients and then walk out with a bowl of delicious and comforting soup in minutes. There are not a lot of recipes you can say that about! This recipe makes 2 large bowls or 3 smaller ones. I keep the recipe in these increments since it equates to one tray of mushrooms and the better part of one carton of chicken broth. I’m also only cooking for 2 or 3 most often. That said, you can double or triple the as needed, to feed more. Be sure to taste your soup before serving and adjust seasoning as necessary. While the chicken stock will have some salt, you will probably want to add a bit more. And some freshly ground pepper is always nice! If you taste it and it seems like it needs something, it’s probably salt! Finally, a word about the cream. If I have it, I’ll always use heavy, whipping cream in this soup. It doesn’t need a lot and it doesn’t put this soup over the top in the richness department. It also makes for a thicker/creamier soup. If you don’t have or want to use heavy cream, I’d suggest mixing whatever lighter cream or milk you use with a couple of teaspoons of cornstarch and adding to the soup. It will thicken up the lighter cream. This recipe makes 2 large bowls or 3 smaller ones. I keep the recipe in these increments since it equates to one tray of mushrooms and the better part of one carton of chicken broth. I'm also only cooking for 2 or 3 most often. That said, you can double or triple the as needed, to feed more. In a large saucepan, melt 1 Tbsp. of the butter over medium-high heat. Add the onions and cook, stirring, until soft, about 3 minutes. Add the mushrooms, thyme, salt, and pepper and the second 1 Tbsp. of butter. Cook, stirring regularly, until the mushrooms start to brown, about 5 minutes. Add the last 1 Tbsp. of butter and stir to melt. Add the flour and cook, stirring constantly for about 30 seconds to a minute. Add the stock and stir while returning the mixture to a boil. Reduce the heat to medium-low and simmer uncovered, stirring occasionally, for 10 minutes. 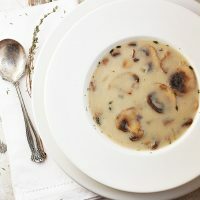 *At this point, if you like a thicker soup, you can remove a few of the mushrooms with a bit of soup to puree and return to the pot or simply pulse a few seconds with an immersion blender. Neither is necessary if you'd rather leave it with all whole mushroom pieces. Add the cream and cook for a further minute or two to heat. Taste and adjust seasoning, as necessary. Enjoy! 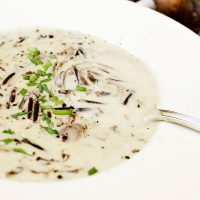 Delicious mushroom soup with added goodness and flavour from wild rice. Like a chunky mushroom soup? This one fits the bill perfectly! So easy, even a caveman could make it. Utterly delicious. I made this the first time just because I had some leftover mushrooms and didn’t want to throw them out, but now this soup is a favorite and I know I’ll make it many times. Thanks for a great recipe! This tastes amazing and my family and I loved it!!!! Totally comfort food and a HUGE hit with my mother and older sister!!! Will definitely make this again!!! Thank you for a delicious soup!!! Doubled the recipe so I could pack it in lunches. There was nothing left! HUGE hit. Very easy recipe. My 11 yo daughter called it comfort food. Served with grilled cheese so its our first meatless meal in a long time. Love love love it. Love mushrooms but haven’t always been a fan of cream soups. Easy covert with this receipe! Doubled receipe in order to get two meals. Easy to make & VERY yummy! So glad to hear, Irene :) Thanks! So easy and delicious! Thanks for this great recipe. I subbed cornstarch for the flour to make it gluten free. Yum! Easy to make and very tasty. Definitely will make it again. This was dinner tonight. A very easy and tasty mushroom soup. I pureed some of it but left a lot of larger pieces of mushrooms. I used evaporated milk vs whipping cream. Though whipping cream would have been yummy, I didn’t have any. Thanks for a great recipe. So glad you are enjoying this soup, Linda :) And yes, a perfect way to warm up. We’ve been in the deep freeze here, as well! The depths of Winter, for sure! Thanks. Super easy to make and turned out great. Also, thank you for giving me the courage to spend more time cooking down the mushrooms to brown them well. Fully worth it, and again, I’ve learned something new. Wow! While making my annual Turkey and rice casserole, using leftover turkey from Christmas, I realized I didn’t have a can of Cream of Mushroom soup. I Googled for homemade recipes and yours popped up! Wow! Wow! Wow! Will NEVER buy the canned stuff again! Who knew Cream of Mushroom soup tasted SO good! Thank you! Even my adult daughter who never liked the stuff (canned) loved your recipe! So glad you discovered it, Patty :) It was a revelation for me, too! Thanks! Thank you for this! I’m always trying to learn to make things from scratch now that I have kids and to be practical at the same time, this is exactly that. Only added some dried onion powder and increased the salt and it was so yummy. So glad you enjoyed it, Daniela :) Thanks! Which would be better to use, beef broth or vegetable broth as I don’t have any chicken. My son followed your recipe today. He did puree some of the mushrooms with the whipping cream and it did make for a much thicker richer quality of taste. He liked using herbs from his garden. It seemed to remind him how things were made for years before canned soups were a stable in most kitchens. So glad to hear, Ragina and yes, it’s just a simple coming together of a few good ingredients, but something special in that :) Thanks! My daughter has never liked mushroom soup. I decided to make it and I was too lazy to dig up my usual recipe, so I used my phone to Google a new recipe and found yours. My daughter was reluctant to try it but she knows the rules— she has to try anything new at least once. She has now given me strict instructions: “Make THIS recipe from now on!” Thank you so much for this. It’s quick and delicious. That is so awesome! My daughter had a thing about mushrooms growing up too :) So glad this soup won her over. It’s one of my favourite bowls of soup and so easy, too. Win. Win :) Thanks so much. Excellent! Skipped the onion (allergies) and used the homemade turkey stock from last week’s Canadian Thanksgiving. So easy, so fast and so tasty! Wish I had made a bigger batch. Will be making again soon. So glad to hear and great idea to use your turkey stock. I bet it was lovely :) Thanks! Made this tonight. It is wonderful. Thanks for the recipe!! So glad you enjoyed it, Anne :) Thanks! Love this easy creamy mushroom soup. This website is phenomenal. Recipes are easy, limited ingredients, perfect for me! I’ve used several of the recipes to rave reviews. Not bad for a non-cook! Thanks Claire! I love hearing that :) Some of my favourite recipes are the simplest and quickest and this is definitely one of them! this soup is SO delicious!!! I added a bit more chicken broth (didn’t want the soup thick) but waited until it had boiled before adding the extra. I also added a few chopped garlic cloves with the onion/butter mix. The soup was amazing and so easy to make! made a bit more than 3 bowls of soup, perfect amount! Thanks so much for the recipe, I’ll be making it again! So glad you enjoyed it! 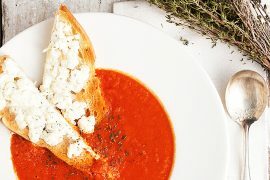 One of my favourite quick, easy and delicious soups :) Thanks! While I often make soup, I had never made cream of mushroom soup and I wanted to give it a try. I googled recipes and chose yours based on its simplicity and the rave reviews. So glad I did. My husband said that this was the best soup that I have ever made. I’m looking forward to trying out some of your other recipes. So glad to hear, Karen :) It’s one of my favourites and the fact that it is so fast and easy is just a huge win.win. Thanks! Excellent and easy recipe. I added a couple tweaks that I thought I’d pass along. First of all I doubled the recipe since if I’m going to the trouble of making soup there might as well be double the goodness. I doubled the single recipe amount of spices (ie quadrupled for a double recipe) plus added a tsp garlic powder. I added a couple tbsp.’s corn starch when I added the flower. Makes a perfect thickness without taking away any of the mushroom pieces by blending. Also a tbsp of sherry when I added the cream. Totally awesome! Sounds delicious, Lyle! So glad you enjoyed this. Thanks! Fantastic. Didn’t use flour as we don’t eat grains. Added small pieces of mesquite tri tip that we over cooked (new smoker) with 3 types of mushrooms. Juice & fat from meat along with homemade bone broth. Heavy cream and lots of butter. Amazing & will make again and again. 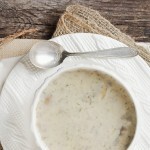 My husband and I LOVE this mushroom soup recipe! This recipe was my first attempt, ever, of making fresh mushroom soup; and it was gone by night’s end. It is that good! The recipe is so simple and the results are so good and rich (ok…I may have added a little extra butter at the very end, 1-2 Tbsp of “salted” butter. Mmmmm!, Oh my!, Delicious!) Tonight I decided to make it again but this time I doubled the recipe. I use both button top and baby portabella mushrooms, yum! I also do the immersion step to make it a little thicker, plus I enjoy the different size pieces using this method. It really is fantastic!! Thank you for sharing this recipe, well done! I will be checking your other recipes too. That way I can try some of those as well! So glad you are enjoying it :) It is one of my favourites and the fact that it is so easy to make is just a huge bonus! I just finished eating this soup. So easy and quick to make with a delicious, comforting result. It’s a moody day today, and this hit the spot. My only mistake was not doubling the recipe. Thank you for sharing! Thanks Rebekah and so glad you enjoyed it :) It’s a great soup to just whip up any time. So easy, but so delicious! Im from India and we predominantly get button mushrooms here so was looking for a recipe that would ne suitable. Everyone loved have already got requests to make it again. Thamk you for the wonderful recipe. I’m very excited to try this recipe this weekend. Just a quick question, does it freeze well? I’m planning on freezing lunch sized portions and I am worried the soup might separate. Any insight would be lovely! Hi Madison, I have to confess I’ve never frozen this, as it makes a very small batch and we tend to eat it in one sitting. You might want to make a double batch if you are looking to freeze some for lunches. Now as for the freezing, I suspect it would separate a bit, but would probably come back together nicely when re-heated. That’s my guess. This is SO delicious. I loved it so much. Since I’m single, I appreciate that it makes a modest sized batch… not a HUGE batch. I am making it AGAIN this weekend! I came across this yesterday and put it together last night… Excellent on a rainy night, served with warm, crusty Italian bread for dipping.. I like that it doesn’t make a bunch as there are only the two of us at home.. I sent the link to your site to my daughter.. She and her husband will love this recipe.. I have made this soup twice in the last 3 days and still can’t get enough. I have sent the recipe to my daughters and sister so they can make it too. Thanks! the pot of deliciousness is on the stove as I type………….tasting make me feel all warm and fuzzy. Weather perfect for this. 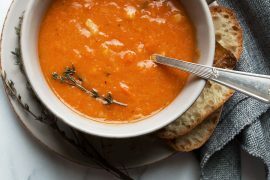 This soup is amazing and easy to make. Thanks for the recipe. Delicious recipe! I used organic unsweetened almond milk with cornstarch instead of the cream and it was just as good! Thank you for sharing! I made this soup last night and let me tell you, It’s to die for. Can’t wait to make it for my mom. I have spent years looking for a simple and delicious mushroom soup that tasted like my mom used to make.Hers was called Campbells and required a can opener.lol.Well the hunt is over.So simple and so delicious.Thankyou.Cant wait to try some of the other recipes. I’ve cooked this half a dozen times now. It’s delicious. Today’s is a triple batch for a potluck at work. I keep cooking this regularly and I found that added a block of cream cheese makes it even better. Made this soupl last night, and it was so quick and easy! Simple, straightforward ingredients…delicious. So glad you enjoyed it, Dianna. I love it for too, for just those reasons! Love that this is made completely from scratch – something I’ve been wanting to do for years! You would love it. From scratch in 20 minutes! Looks delicious Jennifer! I like it when you revisit the classics! Thanks Renee. These are all recipes that have served me well for many years. Hope others might enjoy them too! 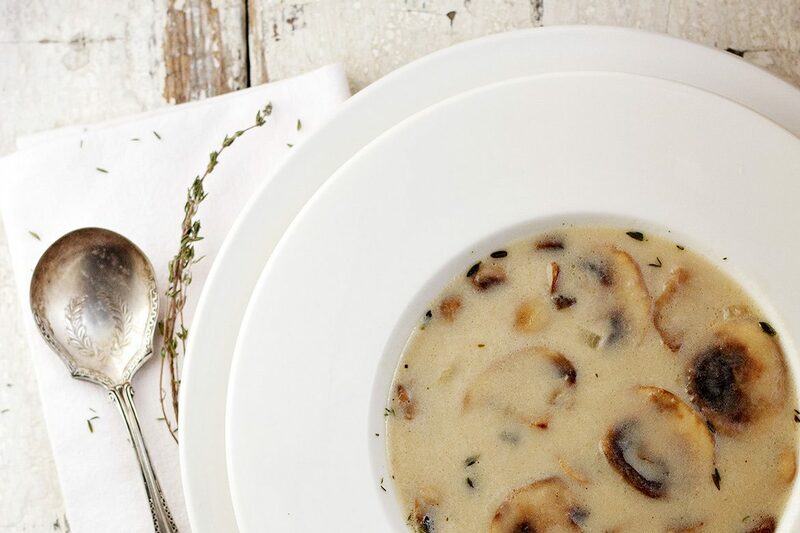 I love anything with mushrooms & thyme, this soup sounds so comforting! There is nothing better than the classics!! This soup looks delicious! Thanks so much, Katie. It is one of my favourite soups.